At least I could still recognize their faces, but then the work of human flesh began. In the spring of 1811, when I arrived at a large plantation in North Carolina, the slaves were driven to work from sunrise to sunset. The bitterness that individuals suffered frequently showed through their faces and scars. 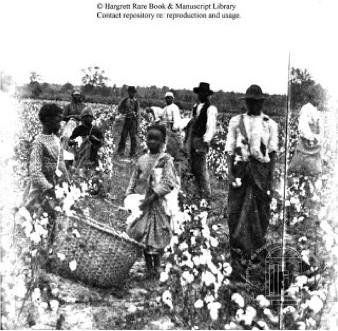 The fields were filled with dark shadows of workers, picking up cotton. They were bond with other slaves in neck irons, handcuffs, and chains. Although, there were laws to limit American participation in the transatlantic slave trade in 1807, they could not be used to stop the trade itself. The passed law focused on ships, sailors, and investors rather than what should happen to slaves illegally brought to America. Still, after 1808, the number of slaves declined, as a consequence of the high death rate. As I saw, these slaves appeared to be not in good conditions, both physically and mentally. Their master provided them bad diet, and cheap clothing and shoes. It almost seemed impossible to work under this almost prison-like condition, but these people did; in fact, they worked everyday. On the right side of the plantation, there was an old Grecian style family mansion, which probably belonged to the slave owner. The house stood among cleared and flat soil, worn out in cultivation by the previous proprietors. At night, on landing at the workers’ rough cabins called slave quarters, the slaves mingled, from small children to old men. It was hard to tell the ages of the slaves in the dark. This was my first experience walking into a slave shelter. James L. Bradley was one of many who were purchased for their freedom. “The master rarely gave us meat or fish,” he said, staring blankly at my face. It was not hard to tell that he was unhealthy. “I was tormented with kicks and knocks more than I can tell,” he added. Punishment of slaves was not surprising, and this feast of blood was not considered as a crime. “I have never said that I had enough food or my clothing. But I let the subjects alone, because I cannot think of any suitable words to use in telling you,” he mentioned. Once, when he was sick from being over-worked, his master came to him and said “this fellow will never be of any more use to me — I would as soon knock him in the head, as if he were an opossum.” Nevertheless, Bradley’s faith in Christian gave him the strength to deal with these awful conditions and melancholy. During the early 1700s, few North Carolina slaves were converted to Christianity, but the number of Christian slaves was also increasing over time. But sorrow was surely a large component in the slaves’ lives. When I was about to leave, I saw a young girl looking at me with a face that I would never forget, longing and praying for freedom. I thought to myself: if I were her, I would not wish to live there any longer either. A few weeks later, I started again on my journey and proceeded to the east coast of the Mississippi’s river, the area that was known for its initial European settlers, as the German Coast. It had been only two weeks after the revolt happened in the area, known as German Coast Uprising, in January. According to Rasmussen, a group of around 200 enslaved men rose up from the slave plantation around New Orleans and set out to conquer the city. “In order for it to succeed, they needed numbers,” said of the enslaved man in the area. Along the area of dense populated slaves in sugar plantation, they collected more men, almost 500, marching their steps together. Most of the slaves in New Orleans were brought from New Central Africa. I could still see the signs of past struggle and fight near the city; the official military companies attacked the slaves to stop them from advancing on New Orleans. It was the largest act against slavery that I had ever known. The witnesses remarked on their carried weapons of guns, cane knives, and axes. “In the end, there were around 100 slaves killed,” said one of the witnesses. “But only two white men died.” This caused widespread panic in the territory. “They were motivated not by fear of the lash, but by the hope of freedom” an enslaved man in the area added. But today, many planters, dressed in gloves, hats, and cravats, walked around the city as if nothing had happened. The roads bustled with carriages and horses. After staying at the plantation in the North Carolina, I saw the terrible slaves’ living condition, which might become the motivation of the revolt. However, for some reasons or other, slavery was still absolutely necessary for the economy, both plantation and industry. With no doubt, I could say that slavery helped the country developing in many ways. In fact, no slave revolt in the area was ever successful, and the failure of the rebellion was clear: torture, burn, or decapitation. Around 10 years ago, in the case of Gabriel Prosser, he planned a large slave rebellion in the Richmond area. And as a punishment, Prosser and the followers were hanged. 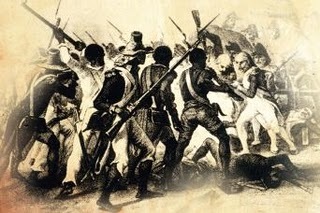 These series of rebellions might offer the country to a new step, either backward or forward; however, in conclusion, we, as a country, still had great demand in slaves, especially for Southern plantation. Brinkley, Alan. The Unfinished Nation: A Concise History Of The American People. Volume 1. 7th ed. Page 257-265. New York: McGraw-Hill Companies. 2010. Print. Bailey, Thomas Andrew. “The South and the Slavery Controversy, 1793-1860.”The American spirit. Boston: D. C. Heath, 1963. 377-379. Print. Sternberg, Mary Ann. “Along the River Road: Past and Present on Louisiana’s Historic Byways,” Baton Rouge: Louisiana State University Press, 2001.